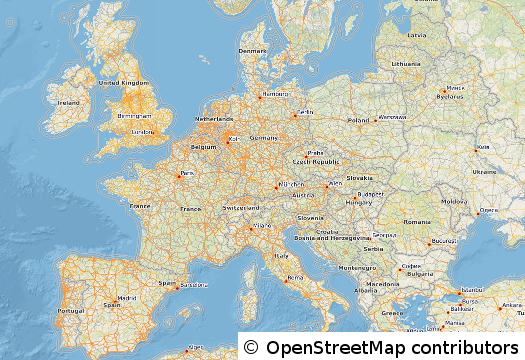 This service presents the data of the OpenStreetMap-Project in a clear and simple way. The WMS is rendered with the help of GeoServer and is cached and accelerated with the help of MapProxy. The service is updated weekly and covers the whole world. Central europe gets cached up to zoomlevel 20, which corresponds to a scale of 1:25.000. All request which go lower this scale will be served on demand. These on-the-fly served tiles will still be saved in the cache, so that reoccuring request to the same area will have quick response times. Every week we produce and recalculate approx. 260GB of map data for you. Every day we deliver more than 22GB of map tiles. The import of the planetfile of OpenStreetMap, which currently is about 43GB, is done through Imposm3 and takes about 30 hours to complete.